View More In Seasonal Décor - Page 2. The Deluxe edition is our most our most dramatic captures life-like realism. This is an heirloom that will be a source of meaningful joy for many years.These beautifully detailed and life-like figures are made of cast resin and are designed to capture the joy of the Holy Family.The realism of Joseph's loving expression and the angelic serenity of Mary as she cradles the newborn Jesus bring the reality and beauty of Christmas to life. Jesus can also lie swaddled in the manger.Humble shepherds cloaked in simple robes are depicted with the Angel of the Lord. The angel, with spectacular wings and outstretched hands, delivers the Good News to the first on earth to learn of Christ's birth. The set is made of cast resin. 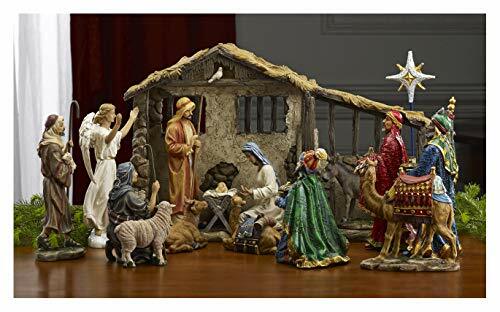 This beautiful scene comes to life with hand-painted detail.Combine the Shepherds & Angel, Three Kings Following the Christmas Star and Holy Family sets to make up The Real Life Nativity. The dramatic, life-like realism and real gold, frankincense and myrrh create an heirloom that will be a source of meaningful joy for many years to come. These richly colored figures of Melchior, Balthazar and Caspar bring the Three Kings to life like never before. The figures are regally adorned in bright colors and dramatic detail. Designed to stand as part of the Real Life Nativity or separately, these cast resin figures show the Magi as they gaze towards the Christmas Star on their journey to Bethlehem.Each of the life-like figures carries a chest that opens to reveal the Original Gifts of Christmas.The standing figure of Melchior holds a chest filled with real 23k gold floating inside a glass vial. The kneeling Caspar chest opens to reveal authentic Arabian myrrh and the standard bearing figure of Balthazar holds a chest filled with the finest and purest frankincense available from the same regain - the Dofar region of Oman known as Sheba in Biblical times - as the frankincense said to be given by the kings. If you have any questions about this product by THREE KINGS GIFTS THE ORIGINAL GIFTS OFCHRISTMAS, contact us by completing and submitting the form below. If you are looking for a specif part number, please include it with your message.